"We Tow Them All - Big or Small"
Speedway Towing offers many services related to muffler and exhaust and will take care of them quickly in our garage. 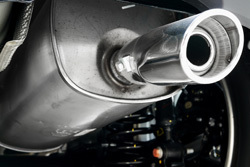 We offer muffler and exhaust installation and repair. 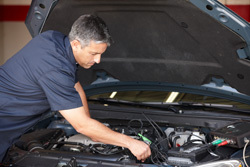 Your car may need an exhaust repair if it is noticeably louder, you hear a rattling noise, you are losing power, or your check engine light is on. Common repairs involving the muffler and exhaust include replacement of system parts, cutting and welding parts, replacing gaskets, determining if the catalytic converter failed, and replacement of oxygen sensors. We also repair small holes, stuck valves, and loose brackets. For preventative maintenance, you should avoid short trips, get your car checked out as soon as the “check engine” light comes on, and repair small problems early such as broken exhaust hangers. It is important to keep these parts working well because they direct harmful engine exhaust gases away from the inside of your vehicle, reduce pollutants released into the atmosphere, and minimize noise. Vehicles that fail a smog test may have a problem with the catalytic converter. It is the main filter for cars and turns harmful carbon monoxide and hydrocarbons into carbon dioxide, nitrogen, and water. Speedway Towing gets your catalytic converter back in working order. When a catalytic converter fails, it is usually because of an engine related problem, so there may be additional parts to be replaced. We will determine the reason for its failure and inform you of other things you may need to fix. We also work with dual exhaust systems to service, repair, and replace them. There are five main types of dual exhaust systems. True dual is two separate pipes all the way to the back that never merge, reducing back pressure and providing better performance. H-pipes are designed to quiet the popping noise that occurs due to exhaust pulses while increasing power. X-pipes merge both pipes together and the exhaust travels through both, making it even quieter than the H-pipe. Y-pipes are when two pipes lead to one bigger pipe. It creates a vacuum effect which makes for a cleaner burn. Finally, the flex pipe sits between the catalytic converter and the manifold. We fix rust, loose connections, noise problems, and any other minor or major repairs. Speedway Towing also provides parts and service for high performance auto parts. This includes repair and maintenance as well as upgrades for your vehicle. Some parts to consider for higher performance include a free-flowing exhaust system, test piping, free-flow air filter, and superchargers, which funnel large quantities of air through the intake manifold and provide quick bursts of energy. Other parts that will enhance performance include a cold air intake kit, performance chips for the computer, and putting in lightweight parts to reduce the overall weight of the car. There are still easier options including switching to synthetic lubricants, using larger throttle bodies, increasing compression, and adding a stub stack. We help you find ways to increase your car’s performance and maintain it. Speedway Towing will accurately bend stainless steel to match your supplied pattern, install the fitting, and create flares. We provide custom pipe bending solutions for modifications such as engine swaps, disc brake upgrades, transmission changes, fuel line routing, vacuum lines, and hydraulic lines. Whether you need one custom tube or piping for a completely custom vehicle, we can do it all.